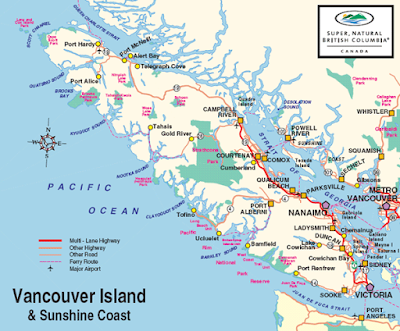 To local people who live on Northern Vancouver Island, the North Island begins just North of Campbell River. There is a spot on the highway marked "Middle Point" which denotes the approximate geographic centre of the island. While Campbell River, Courtenay and Nanaimo all at times refer to themselves as the North Island, the geographically demarcated North Island has some different characteristics. It is home to the Kwakwaka'wakw people. It is more remote, with smaller towns and a larger First Nations population. Many people in the North Island can trace their roots back both to First Nations and early European settlers. The economy of the area is largely based on natural resource industries. The communities are friendly, tolerant, and welcoming. 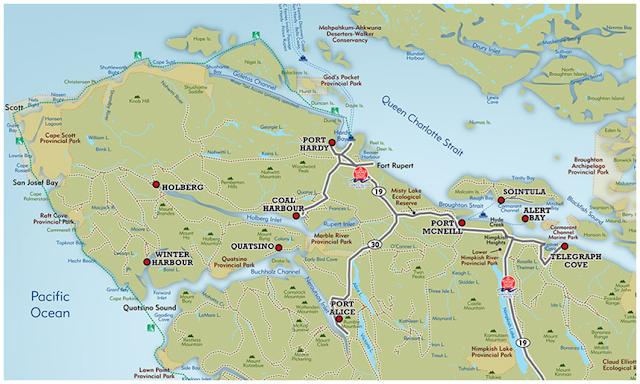 For the history buff there are numerous museums to explore, including: Umista and those in Alert Bay, Coal Harbour, Echo Bay, Port Alice, Port Hardy, Port McNeill, Quatsino, Sointula and Zeballos. As well, the Telegraph Cove boardwalk provides numerous interpretive signs about the area's history. If you choose to visit the North Island, there is a limited amount of paved highway (Campbell River to Port Hardy and Port McNeill. Other areas are accessible via active logging roads (best navigated with a radio that you know how to use) or by boat (water taxi charters are available).